Located in the middle of the Andes Range, in the center of Vicente Pérez Rosales National Park, the Hotel Natura Patagonia invites you to discover an untouched world. With its forests, rivers of great fishing and chain of lakes, islands, volcanoes, valleys and mountains, Peulla will give you a sense of the austral nature. 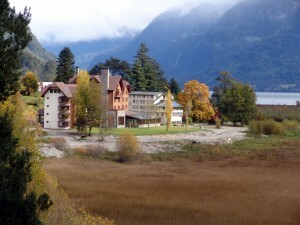 Built in the Swiss traditional style with modern construction and equipment, the Hotel Natura Patagonia welcomes you with warm and personal attention. The hotel consists of 37 double rooms, one is wheelchair accessible, three triple rooms and two suites. The eighty square meter Presidential Suite and the sixty-five square meter Executive Suite each have a Jacuzzi, bar and fireplace. Hotel amenities include: Restaurant, bar and cafeteria, lounge, business center, convention center, electronic keys and locks, central heating, internet connection (LAN) and Wi-Fi in common areas, laundry service, gym, massage room, sauna, gift shop, elevators, and room service from 7 AM to 11 PM. Room amenities include: hair dryer, satellite television, direct-dial telephones in room and bathrooms, and safety-deposit box. Hotel Natura Patagonia provides the ultimate in comfort while in a most spectacular natural setting that will be long remembered.